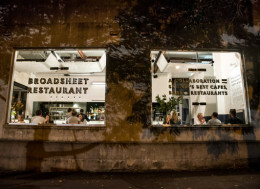 Broadsheet Restaurant features the best of Sydney’s hospitality and is a space where the digital and physical merge. With coffee selections (Mecca for blends and a rotation of Sydney’s best roasters for single origins) from Coffee Kaizen and Cremorne’s Bureaux Collective, a bar helmed by the teams from Bulletin Place and Dead Ringer; and kitchen led by Master’s John Javier, Broadsheet Restaurant is set to make a mark in the scene. The restaurant, launched today, is set up by Broadsheet. The team thought “wouldn’t it be amazing to have your favourite cafes, restaurants and bars in one venue?” And so this temporary space was born. The restaurant features food and drink from 22 of Sydney’s best restaurants – from Da Orazio Pizza & Porchetta, Danks Street, Bodega and more – and will be open for breakfast, lunch and dinner for eight weeks only. It’s a massive project to pull together and Broadsheet had a number of collaborators to lend their thoughts, effort and creativity to see the space come to life, such as Foolscap Studio – the guys behind Noma Australia. desktop chats with the studio’s strategy and design director Dhiren Das to learn more about the elements that were put together for the restaurant. Could you please tell us what the original brief entailed and what elements of it stood out to you? The original brief was to design an impactful cultural experience that celebrates the best of Sydney’s restaurants, cafes and bars within the Broadsheet frame. The design had to respond to the Broadsheet’s brand DNA and speak to the diversity of its audience. 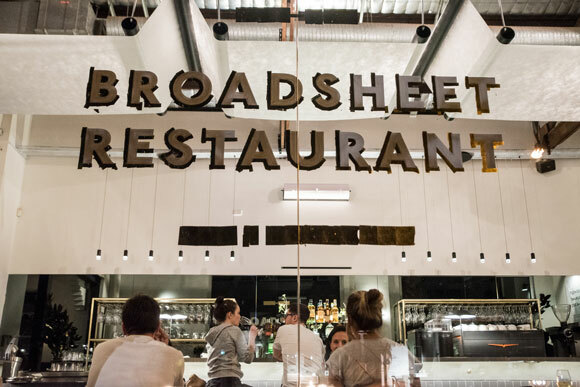 Broadsheet had high level ideas of a restaurant bar concept that would reflect the fundamentals of great hospitality within a contemporary Sydney context. There were references to the classic New York cocktail bar and the rich traditions of European eateries and nightlife. How did these elements translate into the space that Foolscap Studio has created? What was highlighted and why? We wanted to push the brief, and the result was an immersion that reflects Sydney’s now vibrant hospitality culture – through the core concept of ‘digital and physical’. This idea plays on the Broadsheet brand, as a digital cultural medium whose name originated in the physical – and now also celebrates physical cultural destinations. We represented these two ideas through the use of a fairly monochrome treatment across the space; a dark ‘ink’ treatment to objects at low level, which cleanly cuts away to a paper wall and ceiling installation inspired by forms of old newspaper printing presses. The digital overlay within the space is a video installation showcasing the participating Sydney hospitality venues within the space. The video projections are integrated into a paper wall and feature footage from several venues – displaying the making of dishes in kitchens, the people and the spaces behind each venue. Through this, patrons are not only tasting a menu built around the best of Sydney’s food and cocktails, they are connected to these other places in a direct and tangible way. This was an important element not just for its aesthetic value, but also because the video installation creates a sense of place and relationship between the Broadsheet restaurant and the contributors. Was there a part of the brief that was challenging to deliver? If so, what was it and how did you overcome that? Timeframe and budget are always a major constraint with a project of this nature. We ensured that the project team worked very closely with Broadsheet to develop the design and resolve it quickly so that we could meet deadlines. We brought on a builder (Verdecon) who we maintained an open dialogue with around cost and quality, and for this reason we delivered the project on time and on budget. This project has quite a few collaborators: Relative, The Company You Keep. How did the different entities work together to ensure the restaurant turned out how the client envisioned it to be? What were the highlights of the collaboration? Foolscap Studio and Relative work together ongoing as a joint team on projects where the design must respond to a variety of strategic and cultural factors. In this case, the design outcome had to fulfill many objectives – a functional and vibrant hospitality experience coupled with a strong brand message and engaging cultural content that would represent a large number of contributors. Foolscap Studio and Relative co-developed the core ‘digital and physical’ concept and the ensuing design direction, with Foolscap Studio working through the spatial design and Relative working with Broadsheet to integrate the video installation. This process was supported by The Company You Keep which artfully developed the environmental signage and graphics to reflect the Broadsheet identity and overarching concept. This integration of ideas and media is key to any collaboration and was achieved through constant communication between the entire creative team and Broadsheet. Our open approach means lots of regular, quick group meetings so that everyone stays on the same page and can contribute to the master concept. The highlight of this collaboration was seeing it all come together on site – seeing the various facets fit together within a single expression.